Vav Simon is a mother and grandmother who holds great reverence the land and her energies. Drawing on the spirit of nature and her ancient connections from Scotland, she works as a Shamanic healer and priestess which she melds into her daytime job as a doctor of chiropractic and a veterinary chiropractor. She hold senior positions within her profession. Vav works tirelessly to marry the worlds of science and magic. She employs permaculture principles on all aspects of her work as well as in the organic farm that is her home on the Isle of Wight. Vav wrote ‘Old Magic in Everyday Life’, which will catch the imagination of anyone who wishes to peer behind the gloss of present-day life. She ranges from the roots of Old Magic in nature and Mother Earth, passing animals and humans, through past lives and modern life to spells and shamanism. She describes many aspects of the sixth sense, bringing them into the present and offering meditations to try at home. this is neither a fantasy nor a textbook. 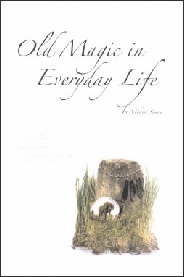 Old Magic In Everyday Life is available at a special price for people booking to attend this Gathering.